Who do you think Brian Wilson was more excited to hang with in tonight’s episode, Barack Obama or Carlos Beltran? He didn’t have a picture of Beltran in his garment bag, so I guess I’ll give it to the President, but by a slim margin. This week’s episode had a lot more going on in it than last week’s, but as I’ve suggested (or complained), I don’t think that the Giants need to have a particularly noteworthy week for The Franchise to eke out an interesting episode, but still, I’ll take it. We started in DC where the team went to meet the President, who good-naturedly joked around with the team, especially Wilson (“I fear it,” he said, in regards to the beard.) It’s the kind of photo-op procedure every president goes through with every World Series team, but still, it’s cute to see the team members all fidgety in their suits and whatnot. As always, I was happy to hear Obama reference the White Sox (the only team the President said he’d cheer for above the Giants.) 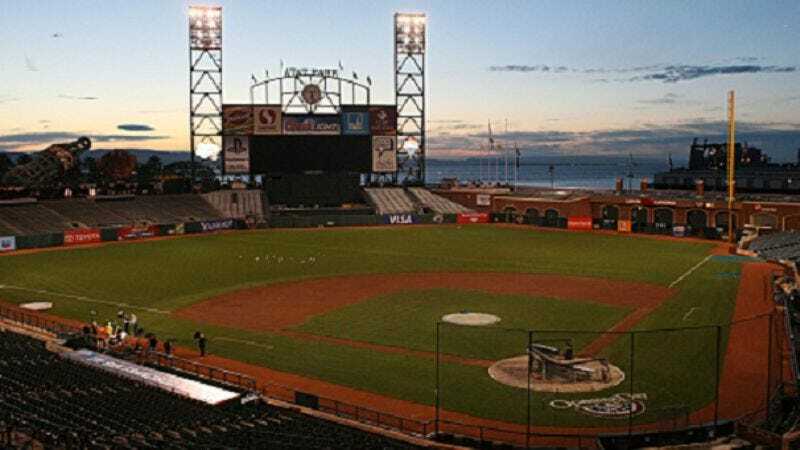 Although I have to be honest, if the Giants made the World Series, I’d probably root against them because unless it’s your team, repeats are boring. Unless they’re playing the Yankees or Red Sox, though, in which case it’s Giants all the way. Yes, I’m a flyover country fan, an East Coast baseball hater. While we were in DC, the episode paused to focus on second baseman Emmanuel Burriss, who was raised in Washington. Burriss lost his best friend and former teammate, DeLoren Young, when he was shot after leaving a nightclub. After hitting his one and only major league home run, Burriss took the ball back home and buried it at Young’s gravesite. I don’t know anything about Burriss beyond what I saw today but I liked him, especially that he had his dad sit with him during his interview. After visiting the President, the team headed to Philadelphia, where the Giants beat the Phillies in last year’s NLCS. The series was possibly a preview of the postseason, but that seemed less important than the buzz over whether the Giants would acquire Carlos Beltran from the Mets. The players all seemed starstruck, noting with awe that if he came to the team, they’d automatically have a new best player. Beltran did indeed get traded to the Giants for pitching prospect Zack Wheeler. I don’t know much about what Beltran’s reputation as a general human is, so fill me in. Based on tonight’s episode, though, he seems professional (he didn’t have anything bad to say about the Mets), clean-cut and quite the snappy dresser. Although was he being a jerk when he said “Do you want your watch with diamonds or without diamonds?” when talking about taking over Bruce Bochy’s uniform number? Beltran doesn’t do anything at the plate in his debut game as a Giant, but he did make a great catch. Sadly, however, due to roster limits, my new friend Burriss got sent down to the minors thanks to Beltran’s addition. I’d like to see the series focusing some on how a new player integrates into a team mid-season so we’ll see if we get any of that next week. Trade talk will probably dominate next week’s episode as well thanks to the addition of Orlando Cabrera, which apparently isalreadycausingsometension. —I’m glad that Sergio Romo didn’t seem bothered by the fact that he has to carry a pink backpack as some sort of punishment for being the newest member of the bullpen. I was intrigued, however, by the fact that baseball players apparently eat peanut butter cups during the game. —Do all players say “welcome to the show” or is that a Giants thing? —I was happy to see Aaron Rowand get a tiny bit of screentime tonight. 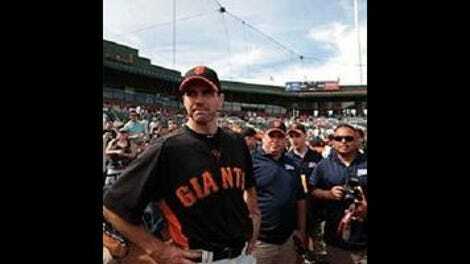 —What will become of Barry Zito?